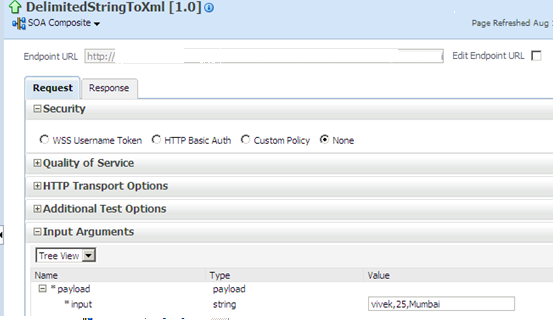 In this post I will explain you how to convert delimited string to XML fragment/format by using “oraext:create-nodeset-from-delimited-string()” function in SOA 11g. We need to use one intermediate schema to accomplish this task, so first we will convert delimited string to intermediate schema format and then to final xml format. To start with this, we need to create a simple composite application. 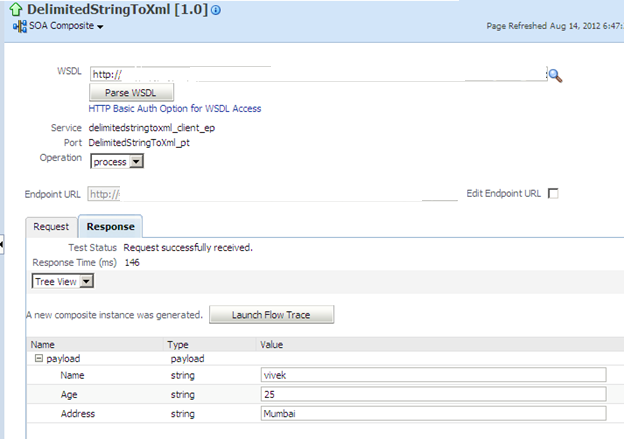 - Now we will convert delimited string to intermediate xml format. To do this we will use one function “oraext:create-nodeset-from-delimited-string” in assign activity and the operation will be CopyList not Copy. - Now we need to transform intermediate xml format to actual xml format. To do this add one transform. - Now we are ready to test our bpel peocess. Go to em console and test your bpel process. Yes Vlad , as you mentioned fn:tokenize is not available currently. 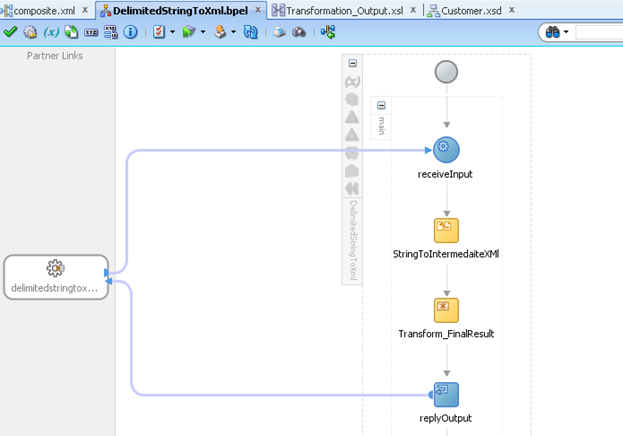 "create-nodeset-from-delimited-string" is also available in transform but again you have to follow same steps, first convert delimited string to intermediate format and then to final format. Can you please post a sample with XSLT? Sample code is attached in the post , you can download it and check the transform. The sample code doesn't have create-nodeset-from-delimited-string IN the XSLT transformation. I'm looking for a way to use create-nodeset-from-delimited-string in a XSLT transf, at the moment, I don't think it's possible. I never tried "create-nodeset-from-delimited-string" function inside XSLT. I will try to create one sample and will share with you. You can not use this function inside transform. This is Bug (14548762). Hope Oracle will come up with solution in next release. Make sure you are using correct schema and mapping nodeset function to CustomerInfo not to Customer element of the schema. Can you please help in this.?? This should work. Please send me your code to my id (gargvivek2008@gmail.com). I will look over it. was there any update on this? i am experiencing the same issue.. I tried but I also got the same response. Seems like this function does not allow null values. Is it possible to create node-set from more than on delimited string? We can use only one delimited string in this function. Thanks for the reply ya.. I think I can do it by for each/Repeat Until and substring functions in BPEL. Lemme try that..